What do you do when a friend gives you a squirrel that he shot while his archery deer hunt was slow? One squirrel will barely feed a person, let alone sharing it with others. In this scenario, the best way to cook a squirrel is by serving the meat as part of something bigger. Ravioli fit the bill this time around and it was delicious! 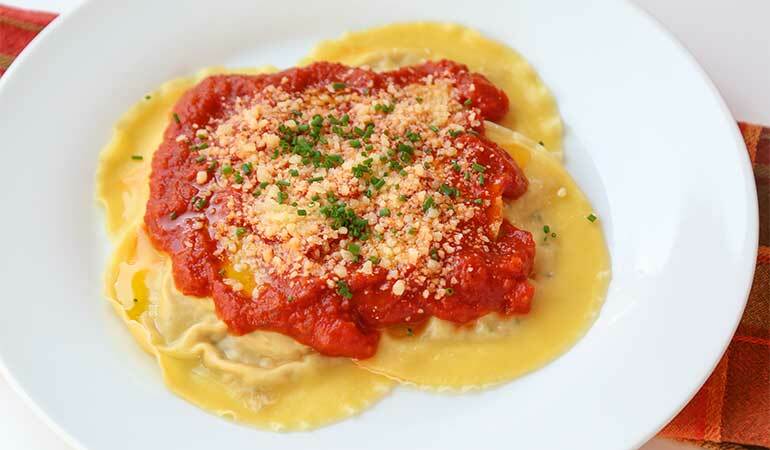 The thinner the wrapper, the more delicate your ravioli will be, but the faster they will cook. 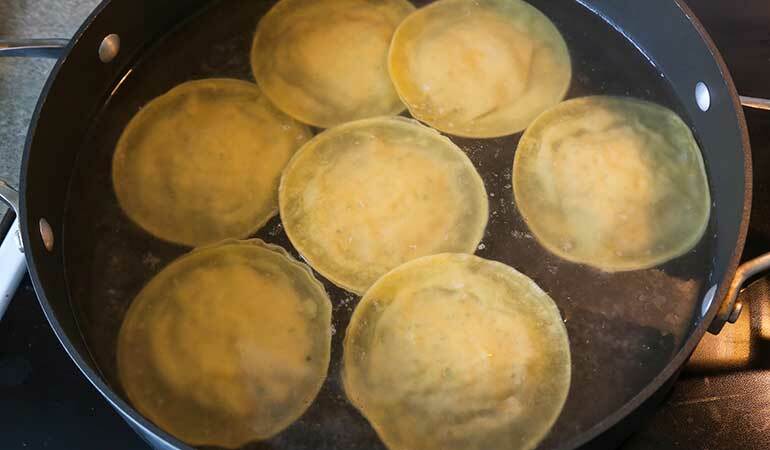 Cooking time is a tad longer with a thicker wrapper, but the ravioli will have a bit more bite to them than the thinner stuff. We chose a thinner wonton wrapper this time, but use what you like. A package of wonton wrappers is inexpensive, so why not experiment with both? 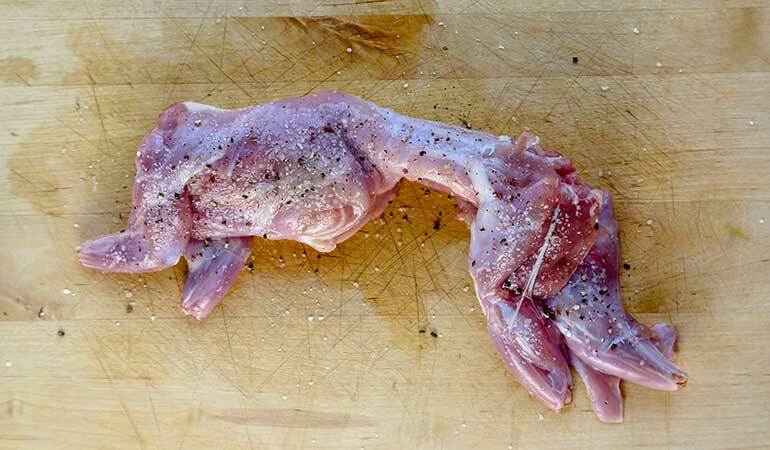 I suggest serving this squirrel dish with a Sangiovese (Italian) red wine. Wash squirrel thoroughly and pat dry with paper towels. (Quarter the squirrel if desired.) Season the squirrel well with salt and pepper. Heat 1 tablespoon of oil in a medium saucepan over medium high heat. Brown the squirrel (or squirrel pieces) on all sides. Then deglaze the pan with red wine and add the cloves of garlic, bay leaf, and 4 sprigs of fresh thyme. 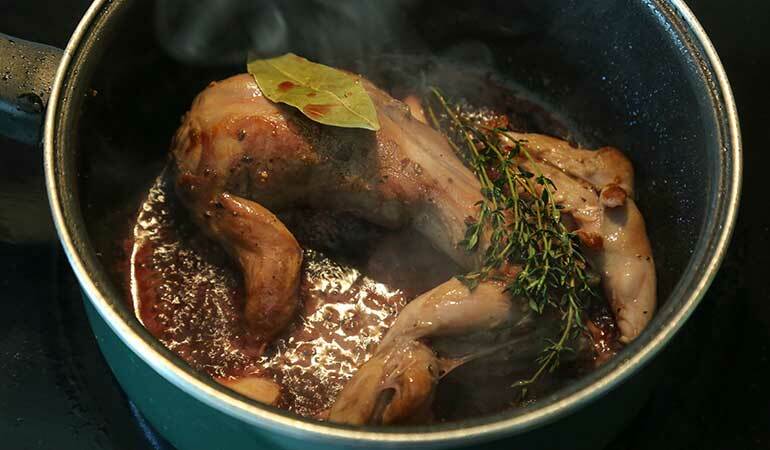 Allow the wine to bubble for 30-45 seconds, then submerge the squirrel by adding chicken stock or water. If you don’t have enough stock, use water the rest of the way. Bring to a boil, then back down to a simmer. Cook on low, covered tightly, until the squirrel meat falls of the bones, about 2 to 2.5 hours. The squirrel should be almost completely submerged in liquid the entire time. Check periodically to see if too much moisture has evaporated – add more stock or water if necessary. Fish the squirrel out of the braising liquid – discard the liquid. When the meat is cool enough to handle, pick off as much meat as you can on the bones and transfer to a food processor. 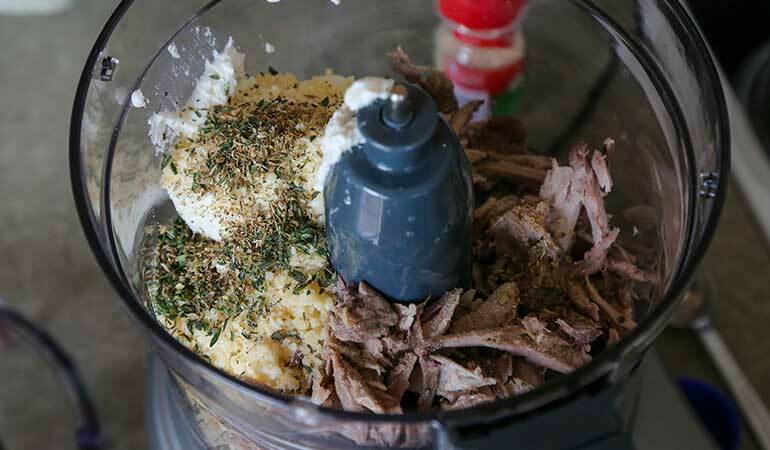 Allow meat to cool completely, then add to the food processor garlic powder, oregano, Parmesan cheese, and ricotta cheese. 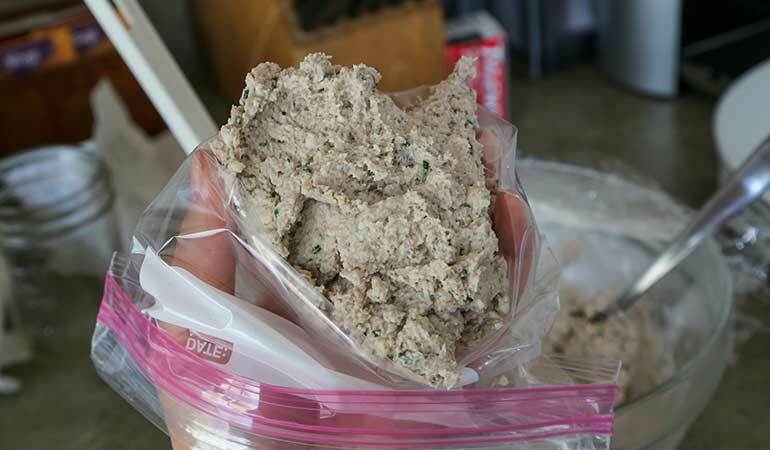 Pulse until smooth – it should be the consistency of pâté. Taste and add salt and pepper if desired. Transfer ravioli filling to a bowl and fold in 1 tablespoon of freshly minced chives. Set aside. To assemble ravioli, spoon the ravioli filling into a zip-top bag and cut off one tip of the bag. Pour a little water into a small bowl. Lay several wonton/gyoza wrappers onto a cutting board or counter and pipe the filling onto each wrapper, being careful not to overfill. Dip your finger into the bowl of water and wet the rim of a filled wonton, then seal well with a second empty wonton wrapper – try to prevent air bubbles. Repeat with the rest of the ravioli. 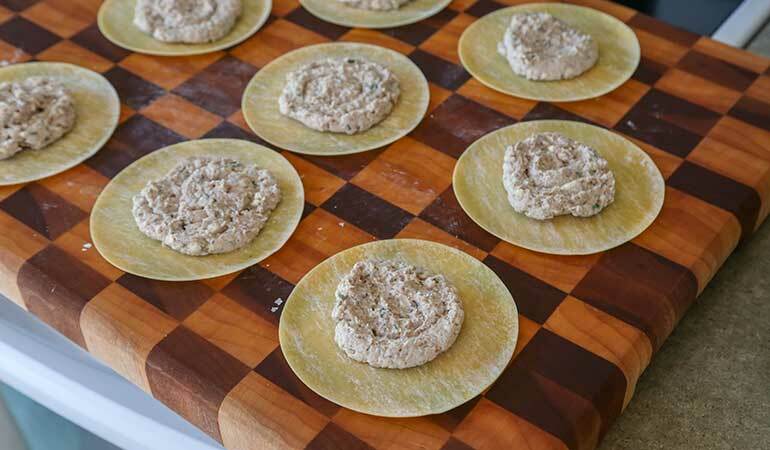 Lay assembled ravioli on parchment paper and cover with a towel or plastic wrap to keep them from drying. Tip: Keep your stack of unused wonton wrappers and ravioli covered with a tea towel, plastic wrap or kept inside a zip-top bag while you work to prevent them from drying out. The edges will not seal properly if they’re too dry. 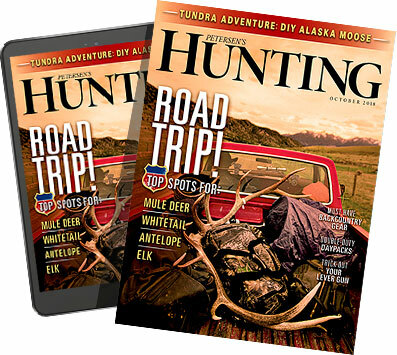 Also, the squirrel filling can be made a day ahead; store in the refrigerator, covered, until you're ready to use, and allow to warm up a bit at room temperature for easier piping. In a large pan, pour in about two inches of water and bring to a simmer. Then carefully drop the ravioli into the hot water; do this in batches to prevent the ravioli from sticking to one another. Do not allow the water to boil or else your ravioli may fall apart. When the wrappers turn translucent and the middle starts to look wrinkly over the filling, the ravioli are done. Carefully scoop them out of the water with a slotted spatula. 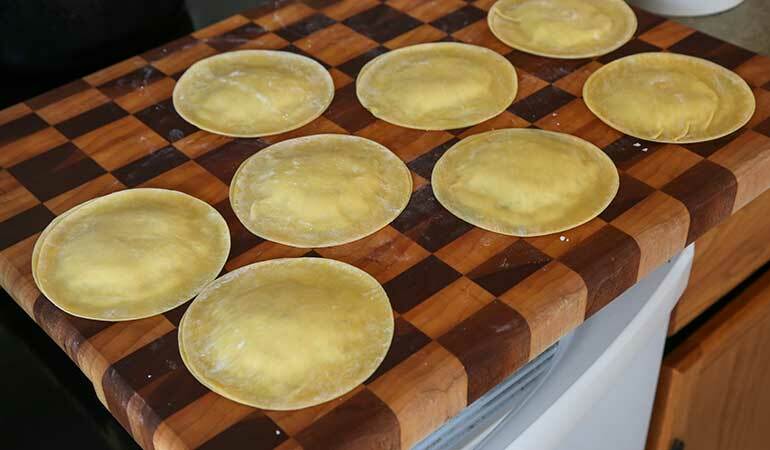 You want to drain most of the water off the ravioli, but leave them slightly wet so they stay moist on the plate. Cooking time will vary from 30 seconds to a couple minutes, depending on the thickness of your wonton/gyoza wrapper. Don’t be afraid to take one out and test it. Serve immediately, as they are cooked, with warmed marinara sauce, a sprinkle of Parmesan cheese, chives, finishing salt, and a splash of extra-virgin olive oil. To keep ravioli from cooling too quickly, I suggest serving them on warmed plates. Do this by placing your plates in the oven at the lowest setting until you're ready to plate and serve, but remember to use a pot holder when you take them out.